Located on Borneo Island, Kota Kinabalu is the capital state of Sabah, in Malaysia. Overlooking the South China Sea, the city is bordered by the Crocker mountain range, peaked by Mount Kinabalu, a UNESCO Heritage Site. Surrounded by lush rainforests to the east and tropical island beaches to the west, this idyllic city has much to offer adventurous travellers. Cheap flights to Kota Kinabalu are now available for a limited time only, so book your flight today and prepare to be enraptured by the tranquil beauty and thrilling adventures of this city! Kota Kinabalu is home to Kota Kinabalu International Airport (BKI), a 20 minute drive from the city centre. 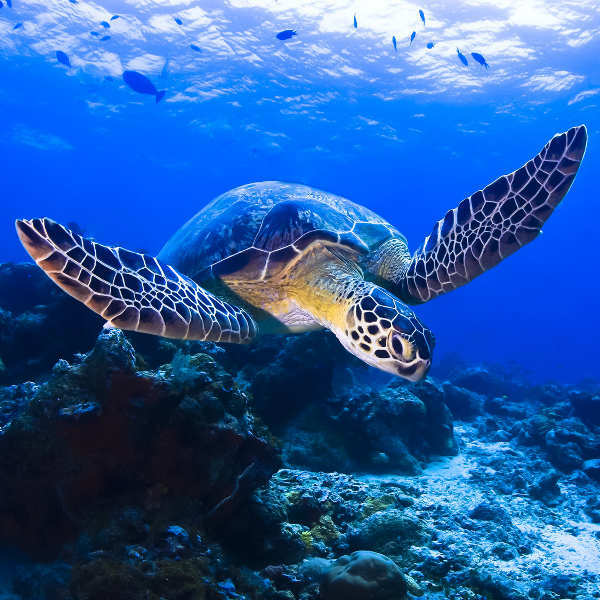 Discover the magnificent turtles and other sea life below the crystal clear, turquoise waters off the surrounding islands. Snorkel from the boat or off the beaches – perfect for the family and experienced divers. Skip the water for a day and walk through the jungle and stilt villages of Monsopiad and Mari Mari, showcasing the traditional customs of the ethnic groups in the area. 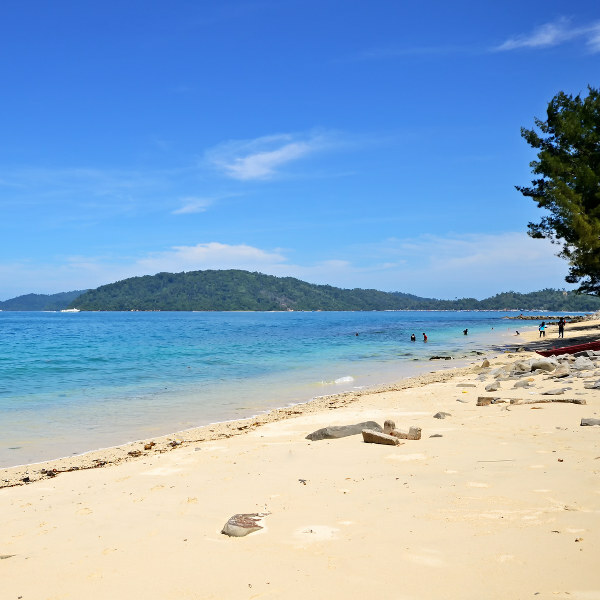 Embrace the island life and hop on a boat to the surrounding islands of Gaya, Manukan, Sapi and Mamutik where a plethora of water sports, beach activities and jungle trekking awaits you. 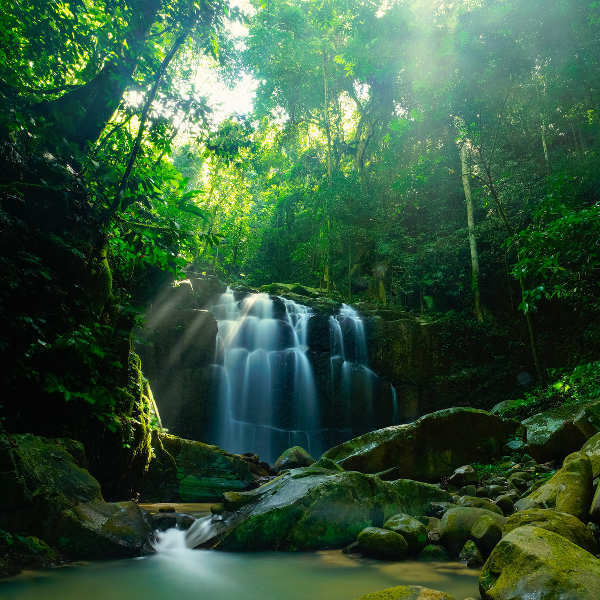 The region of Sabah experiences a moderately warm climate all year round, so you can visit any time! To avoid the heavy rainfall, plan to visit between January and April when the west coast region of Kota Kinabalu becomes drier. The city is famous for its festival season occurring in July, when you can see colourful pomp and ceremony adorning the city streets. Visitors flock to the city during July so be sure to book accommodation a few months in advance. Early May brings the Sabah Fest – a celebration of music, theatre and food representing the various ethnic groups in the region. Take advantage of low-season hotel specials from October to March and catch a glimpse of the orangutans in their natural habitat! 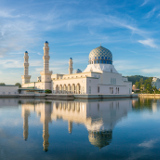 Kota Kinabalu, affectionately known as KK, is an increasingly popular destination on the island of Borneo in Malaysia. It’s the capital and largest city of the region, and an important gateway into Sabah and East Malaysia. Kota Kinabalu’s appeal lies in its seaside location, and proximity to the tropical islands and lush rainforests of Borneo. It’s a hotspot for diving, wetland adventures, and eco-tourism, and the year-round warm weather makes any time a great time to enjoy the vast range of outdoor activities, ranging from sailing and scuba diving to zip-lining through the wild jungles. Diving is one of the most popular attractions here, as the World War II wrecks, coral reefs and underwater rock features make for fascinating viewing for divers of all levels. If you prefer to stay above water, the deep sea fishing in KK is also a popular choice. On land, there are as equally exciting adventures to embark on, like trekking through the cultural villages of Mari Mari and Mosopiad. If you’re heading out of town for the day, swing past Lok Kawi Wildlife Park to meet and greet some rare and exotic species. For a souvenir stop, the Kota Kinabalu Handicraft Market has an array of pearls, crystals and colourful sarongs. Whatever your budget or interests, you’ll have the adventure of a lifetime in Kota Kinabalu! 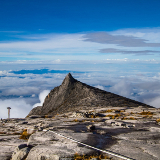 Compare several airlines and book your cheap flights to Kota Kinabalu online at Travelstart! Kota Kinabalu is rated as an extremely safe city. There have been no known incidents of major crime against locals or tourists and bag-snatching and pick-pocketing are very uncommon. The local people seem to have a peaceful and friendly disposition and will happily assist you if need be. Nonetheless, be aware of your surrounding and personal possessions and do not flash expensive items. Walking around is perfectly safe, during both day and night. It is not uncommon for people to leave their belongings on the beach while they go swimming, just keep your eyes and ears out. You do not require any vaccination for this city, or Malaysia in general. Due to questionable food hygiene standards, you may want to get vaccinated against Typhoid and Hepatitis A. It is safe to eat at any restaurant as long as there is a DBKK (municipal council) rating or visible health card on the premises. If you choose to eat at a street food stall, check where the water is coming from, as unboiled tap water is not safe to consume. Should you be in a Malay or Indian café, the customary teapot/ kettle on the table is not for drinking, but for washing hands. Set amidst a plethora of rainforest landscapes and pristine beaches, you’ll be spoilt for choice with accommodation options exuding an atmosphere of tropical paradise! Most of the hotels and resorts are located along the beach and harbour with easy access to the pier-side restaurants and open-air fish markets. In the city you’ll find many hostels and lodges catering towards backpackers. Most of the mid-range hotels provide shuttle services around town and to-and-from the airport. Hop across the bay and stay on one or two of the islands close by! Manukan is a popular island among tourists and offers all sorts of water sports and fun activities for the whole family. For a more private spot, the smaller island of Mamutik and Sapi are equally as rich in marine life and water activities, with ample accommodation. Experience a magical night under the stars by camping on Mamutik Island. Camping gear is available for rent on most islands, once you’ve received permission at the reception points. The best way to see this coastal paradise is with the warm wind blowing through your hair! Scooter rental is very popular and affordable, with options to rent for a couple of hours or a few days. Prices usually include helmets, raincoats and a map, and if you’re unsure of the routes, the operator will happily help to plan your itinerary. Taxi services are fairly new to the island, so you have a choice between Uber and GrabTaxi services. To travel within the city centre, hop on a City Bus (marked green and yellow). These buses operate along four routes and can often get very crowded. If you’d prefer to self-drive, car rental is easily available at the airport and around the city. Since the city centre is relatively small, you can easily walk from one side to the other in 30 minutes. Be aware of wayward traffic when crossing the streets. For the mandatory island-hopping experience, there are many speedboat services operating between Jesselton Point Jetty and the popular islands within the Tunku Abdul Rahman Marine Park.